Marines assigned to Echo Company 4th Reconnaissance Battalion carry rifles equipped with suppressors while conducting a patrol during a live fire exercise (Staff Sgt. Ezekiel R. Kitandwe/Marine Corps). The Marines will soon ask industry for proposals for new weapons suppressors. Marine Col. Mike Manning, commander of Ground Combat Element Systems for Marine Corps Systems Command, said in a panel at the annual Modern Day Marine military expo at Quantico on Tuesday that the Corps will soon be drafting a request for industry proposals. Manning declined to specify quantity or whether the suppressor would be for the M4 carbine or the newer M27 Infantry Automatic Rifle. Manning hinted at some of the potential developments during his comments in the panel, noting that existing commercial suppressors were already available and being tested. But having a built-in suppressor may be better. “OK, there’s a couple out there right now that integrate with the weapons themselves. That’s really where we want to be at. Integrate the suppressor into the barrel,” Manning said. The advantages to that integration are immediate. Though the colonel wouldn’t discuss specifics, he did say the suppressor would be used “across the forces,” indicating a high number of suppressors for more than just select units. Both Army and Marines have been evaluating and testing suppressors for regular infantry units. Special operations forces have used suppressors for decades. 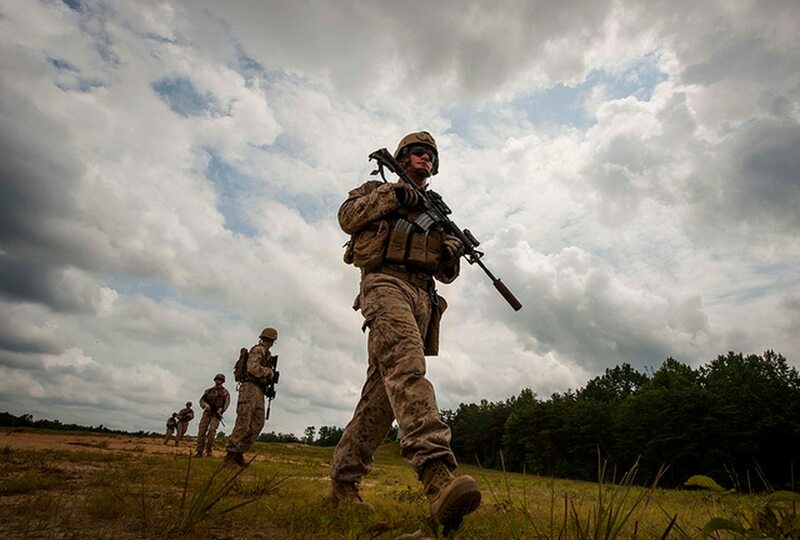 Marines in some battalions over the past year have trained and deployed with suppressors for the M27 and M4. Part of the evaluation process is being conducted by 2nd Marine Division Gunner, CWO 5 Christian Wade. Wade and others see suppressors as a way to bring stealth to the infantry, giving small units better command and control, and allowing improved ambush and attack tactics to disorient adversaries.